I wish I had an MMGM for you this week, I really do. But between last night's high school auction (don't worry, the Don wouldn't let me bid big) and the fact that my son has been in the cast of SHREK: THE MUSICAL, which just ended a two-week run this afternoon, I've barely had time to pick up a book. Next week, I am heading for a blissful two-day solitary retreat at the family beach house on the Oregon Coast--so there won't be any blog posting then. But I do intend to write and read a lot--so look for me on the 24th. 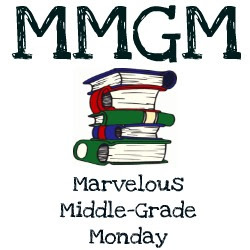 In the meantime, I'm looking forward to seeing what you all have been reading for MMGM. 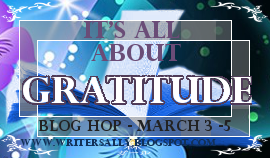 At the beginning of February, Sheri Larsen announced her It's All About Gratitude blog hop. I am not generally a blog hop kind of person, but this topic spoke to me. It is easy to fixate on all that is "wrong" on the road to publication, instead of being grateful for what has already been achieved. When I remind myself to be grateful, I notice first a shift in my thinking, and then a shift in my mood. Please forgive me for being serious and personal for a moment. I would like to share the story of my oldest son, who is now 17. Christopher was born extremely prematurely (at 24 weeks gestation) and weighed 1 pound 6 ounces at birth. He spent four months in an NICU, clinging precariously to life. We were told he had a 50 percent chance of major disability--including cerebral palsy. Now, at 17, he is remarkably unscathed by his birth experience. He did have a form of epilepsy, which he has outgrown (thank you, God! ), and has ADD. We are blessed to have a school in our city, Thomas A. Edison High School, which serves children with learning differences. Christopher has blossomed there. One of the benefits is that the school is on the campus of a large Catholic high school which has a phenomenal drama department. Chris loves the theater, and has been able to take part in several musicals. This year marked great growth for him, as he got a speaking role in a student-directed one act (which he rocked!) We have just returned from a performance of Shrek--this year's musical. Chris was an elf and danced and sang with great gusto. In both the one-acts and the musical, I have found myself sitting there blinking back tears, so grateful that my son is able to do something he loves without impairment. So many things in life are tough--but if we approach life in a spirit of gratitude we can be blessed rather than blighted. Here's the link to Sheri's initial blog post. At the bottom, you can find others signed up for the blog tour who are sharing their experience of gratitude.